Classic beauty with un-compromised strength is just the beginning. 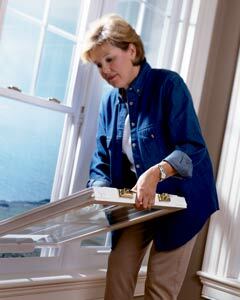 Operable sash Tilt-in and lift out for easy cleaning. Screens removable to the inside eliminate the need for climbing ladders. Weather resistant meeting rail seals sash tightly while unique sill designs force water away from the window during heavy rains. Two cam-action sash locks on all windows over 27" wide, to ensure a tight seal at the meeting rail. Contemporary mainframe design with beveled exterior and low profile screen track for a smooth finished appearance. True one-piece sloped sill adds strength and eliminates the need for unsightly weep holes. Curved moldings provide elegant detail and soft design lines adding beauty to your home. Ventilation limit locks add security yet allow windows to remain partially open. Screens that are removable from inside the home, keeping our customers off of ladders.